Polypropylene Proofing Baskets for bread. 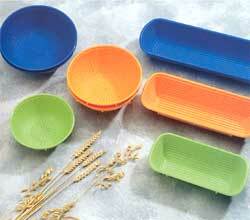 Hygienic, food safe, easy cleaning, dishwasher proof, durable, stackable. Rectangular in 500, 1000 and 1500g capacities. Round in 500, 1000 and 1500g capacities. First Coating - In addition to spraying, coat basket with flour. Shake out excess. This kind of coating lasts for weeks. second Coating - for daily usage coat basket a second time. Shake out excess. Powdered bread: 1/3 potato flour, 2/3 rye flour.